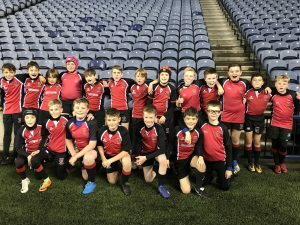 Wee Reds Mini rugby players from Linlithgow added a touch of class to Edinburgh Rugby’s first home game of the season, against Connacht, on Friday Night. 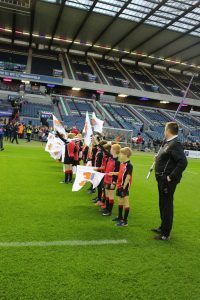 Our P5s got the occasion off to a flying start by providing the Guard of Honour as the Pro 14 players took the field at BT Murrayfield. At half time, our P6s and P7s graced the hallowed turf of the International pitch for games versus Currie and Royal High respectively. The Wee Reds channelled their excitement magnificently, inspired by their storied surroundings to tear into tackles and move the ball at pace to find gaps and score some very fine tries. It was a great relief for the Murrayfield crowd to have some fluid, fast-paced rugby to watch after a rather turgid first 40 from the Pro 14 teams. Richard Cockerill had obviously been looking on and taking a few pointers, as his Edinburgh team stepped up and were a wee bit more dynamic in the second half, having been shown how to play the game the right way by Wee Reds Minis! 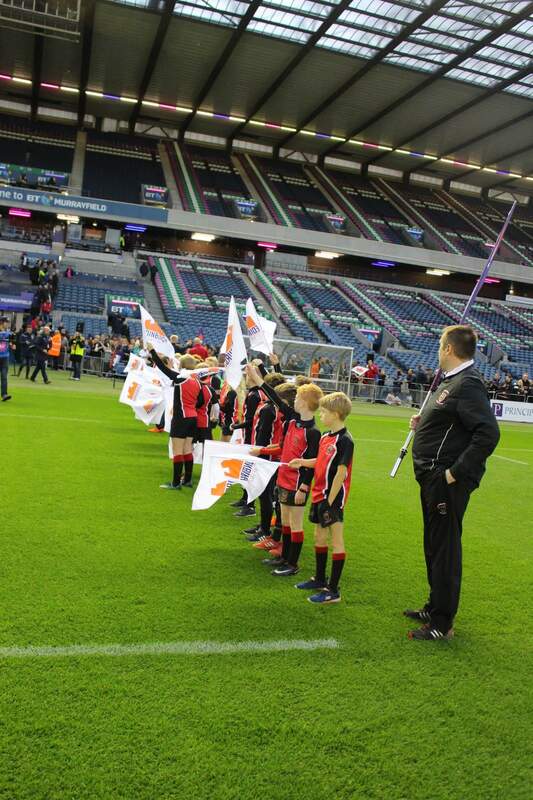 P5 got a pleasant surprise at the start of last week when we got asked to be the honour guard for Edinburgh at the game against Connacht on Friday. Its hard to tell who was more excited, the kids, the parents or the coaches. 24 kids were able to make it and discharged their flag waving duties with panache! A few managed to sneak in some high fives as the Edinburgh team ran out. It was Edinburgh’s first win of the season, the kids can’t take all the credit but it could be that the enthusiasm of the flag waving inspired the players! After that it was back to more normal duties with a squad away to West of Scotland where the kids did really well. The new rules are making for faster games and by the end the kids were pretty tired. We also had home training for those not able to travel. 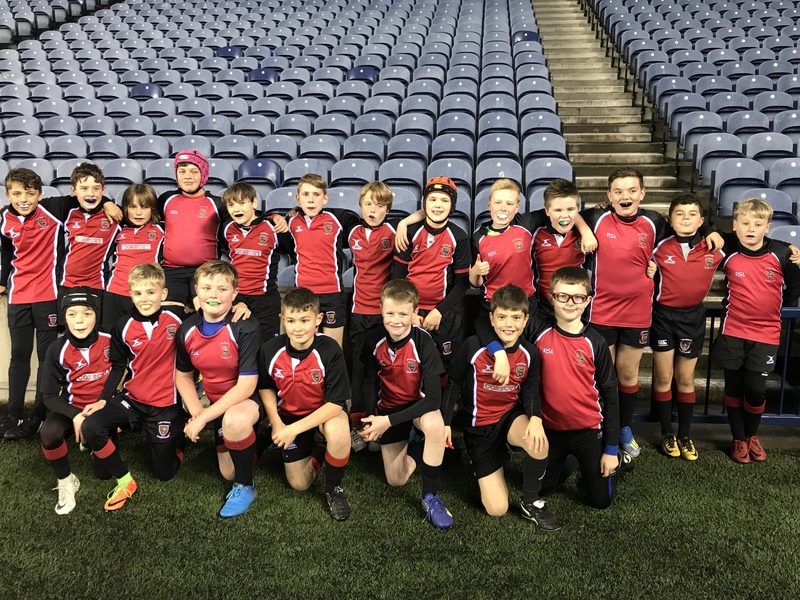 This was a big weekend for the P7 squad and undoubtedly the main event was being invited to play at BT Murrayfield during half time of the Edinburgh game. What an experience for everyone involved! 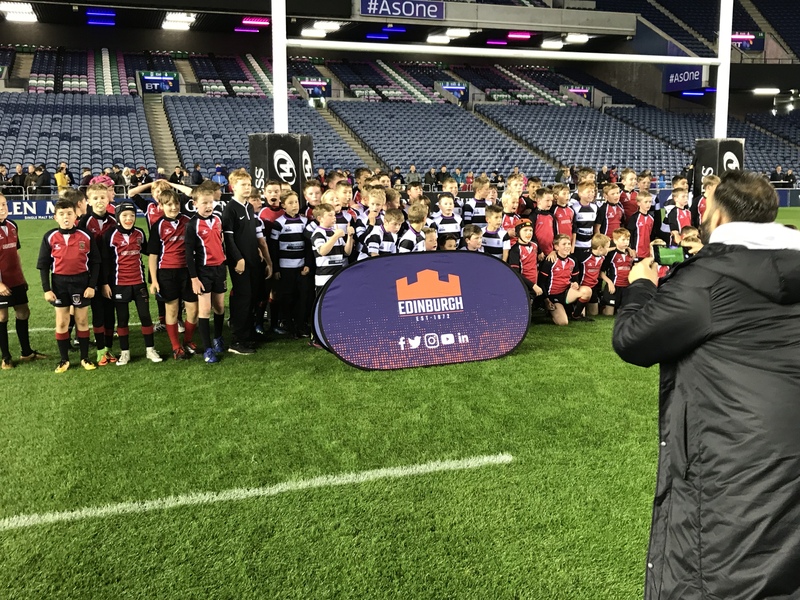 To say the kids were buzzing afterwards would be a huge understatement and we can’t thank Edinburgh Rugby enough for inviting us along. 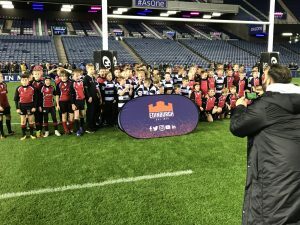 Royal High were the opposition and the game was just 8 minutes long, but despite that the Linlithgow P7s managed to score five tries and concede none. The boys were tremendous and played the best rugby they have for some time – they really did rise to the occasion! Hopefully not the last time they get to play at BT Murrayfield! Sunday brought a fixture against West of Scotland and following the dramatics of Friday night the boys were keen to get playing again. We had one team through for the fixture and they acquitted themselves admirably. Over the course of four games against the hosts we ran out comfortable winners and played great rugby when we had the ball. Most notably we saw some kicking for the first time as the boys get their heads round the new age grade rules. It adds an interesting dimension to the game and it was great to see the lads try out this new skill. All in all a great weekend and one the kids and coaches should be proud of. Saturday evening saw a few hardy souls brave a fairly dire forecast for the third edition of the Mini+Micro parent and player camp out. The afternoon brought together the past players match with our future players, as families arrived to watch the first XV put up a competitive second half showing against Hawick Quins. After the senior sides left the pitch, some fast and furious mixed parent + child team touch rugby was enjoyed by all. Tents were pitched, the barbecue was fired up and a few pints and fruit shoots were enjoyed by participants. The weather held off for a little longer than predicted, which meant plenty of opportunity to run off steam before hitting the sleeping bags. We survived a pretty blustery wet old night and congrats to those who got up and headed off early to play their mini fixture at West of Scotland first thing on Sunday morning!